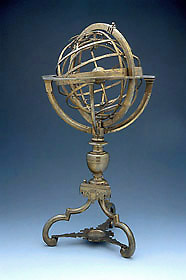 This fine example of a traditional armillary sphere shows the celestial sphere rotating around the earth, and the sun and moon moving through the constellations of the zodiac. There are 17 stars marked on the celestial sphere by pointers, and they can be used to find the time at night in common hours or Italian hours. Cornelius Vinch was a Flemish maker, who worked in Antwerp and Naples. This instrument was made for the Count of Novellara, Camillo Gonzaga, who had acquired an astrolabe from Vinch the previous year. He may have been pleased with the astrolabe and so ordered the more elaborate and more expensive armillary sphere, or perhaps the sphere simply took longer to make and so bears a later date.